In addition to the full look at the cast, a scrolling teaser video that reveals the official title card can also be found below. In it, you’ll see Law as a young Dumbledore, taking on the mantle of one of J.K. Rowling‘s most beloved characters; Ezra Miller makes a return as the enigmatic Credence, whose fate was unknown at the end of the first film; Claudia Kim appears as a Maledictus, the carrier of a blood curse that destines her ultimately to transform into a beast; Zoe Kravitz plays Leta Lestrange, who had once been close to Newt Scamander but is now engaged to his brother; Callum Turner joins the cast as Newt’s older brother, Theseus Scamander, a celebrated war hero and the Head of the Auror Office at the British Ministry of Magic; Katherine Waterston returns as Tina Goldstein, who has been reinstated as an Auror for MACUSA; Redmayne stars again as wizarding world Magizoologist Newt Scamander, who has now gained fame in the wizarding world as the author of Fantastic Beasts and Where to Find Them; Dan Fogler reprises the role of the only No-Maj in the group, Jacob Kowalski; Alison Sudol reprises the part of Tina’s free-spirited sister, Queenie Goldstein,, a Legilimens who can read minds; and Depp returns as the powerful Dark wizard Gellert Grindelwald. At the end of Fantastic Beasts and Where to Find Them, it is revealed that Grindelwald, who had thought to have been dead, was behind releasing Obscurus to the No-Maj (the American version of a Muggle). But he is stopped by Newt Scamander (Eddie Redmayne), and taken into custody. Still, that evil grin he gave hinted that it wasn’t over for wizards, it was merely the beginning. 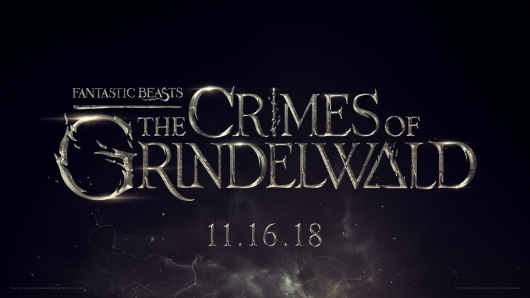 Warner Bros. Pictures announces “FANTASTIC BEASTS: THE CRIMES OF GRINDELWALD” as the title of the second of five all-new adventures in J.K. Rowling’s Wizarding World™. Opening exactly one year from today, November 16, 2018, the film features an ensemble cast led by Eddie Redmayne, Katherine Waterston, Dan Fogler, Alison Sudol, Ezra Miller, with Jude Law and Johnny Depp. It’s hard not to forget that Fantastic Beasts: The Crimes of Grindelwald is the second of five new films when the sequels were announced well before the first Fantastic Beasts‘ release. That announcement told us that they had a lot of confidence in the film, and its success deserved more sequels to explore more of the early days of wizardry. And they were right. Fantastic Beasts and Where to Find Them grossed approximately $812 million worldwide. So just leaving that world with one film would be a disastrous decision. Now we will get to see even more of the legendary feud between Grindelwald and Dumbledore, and how their battles helped pave the way for the events of the Harry Potter movies.